Borderlinx | Buy One Kings Lane and ship worldwide with Borderlinx. Cheap rates guaranteed. A home and lifestyle company, One Kings Lane offers the best of top brands, vintage and designer items at great prices. A member based online shop, One Kings Lane gathered more than 6 million members since its launch in 2009. Every day new sales start on a variety of products, lasting for no longer than 72 hours. With oriental and bohemian accents, the decoration and fabrics are irresistible and add a splash of good mood to any interior. One Kings Lane hand-selects vintage items from American designers and antique dealers displayed in a unique marketplace service. The company is also exclusively offering sales of authentic TV and movie sets props ! 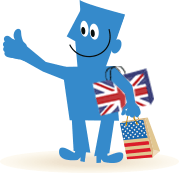 Thanks to Borderlinx you can nowshop One Kings Lane in the USA and ship to your home country, paying cheap international shipping, taxes & duties upfront. Calculate your shipping, tax & duties before purchasing using our shipping cost calculator. A number of services are available through Borderlinx to make international ordering from One Kings Lane USA hassle-free, including concierge, free repacking and consolidation.